Our newest inflatable interactive game is here and its three games in one! Perfect for your baseball, football and or basketball stars! This unit is perfect for events or parties for your competitive star to excel! One station is for baseball pitchers to show their aim, the middle units is for your football star to complete passes into the football holes and last but not least there is a section with a basketball hoop for your future NBA all-star to practice his jump shot! 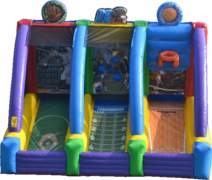 This 3 in 1 sports interactive has it all for your sports star or competitor to create a event to remember!